San Francisco, CA — A man facing five years in prison following a an altercation at the DMV in which combatants wielded office supplies as weapons was acquitted today of felony charges, San Francisco Public Defender Jeff Adachi announced. Jurors deliberated just over one day before finding Jeremiah Lowery, 29, of San Francisco, not guilty of two felony counts of assault against two DMV employees. Jurors instead convicted him of misdemeanor assault after finding he did not use force likely to cause great bodily injury, and also determining he was responding to force used by the DMV clerks, said his attorney, Deputy Public Defender Sandy Feinland. Lowery was sentenced to time served and ordered to complete 12 anger management classes. Several months before the incident, Lowery received a letter from the state Department of Motor Vehicles, informing him that the agency could not issue the California photo identification card he paid for because his application was missing information. 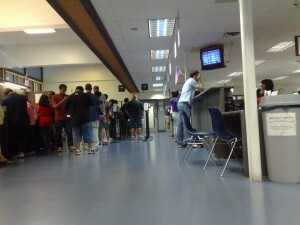 Lowery, who needed the ID to secure housing and employment, unsuccessfully sought help four times from the San Francisco DMV branch on Fell Street. On Aug. 16, he waited in line for the fifth time. He reached the counter at the end of the day, clutching his paperwork. An unproductive verbal exchange ended with an impatient clerk telling him to “f*** off,” he told police. Lowery then refused to move from the window, telling the clerk we would not budge without getting the service he purchased. Lowery told police the DMV clerk then picked up a heavy electric stapler, raised it at him and tried to hit him. Lowery then grabbed the clerk’s computer monitor as a shield. As another clerk joined the fray, Lowery tried to fend off the pair of DMV employees off by swinging the monitor. A security guard then grabbed Lowery, who reflexively punched the guard, knocking him to the ground. Customers then jumped on Lowery and choked him. He was arrested minutes later. Feinland argued that at every step of the escalating confrontation, Lowery was defending himself. “Mr. Lowery just went to the DMV to get his paperwork straightened out. He was not looking for trouble. He certainly didn’t expect employees to fly off the handle and force him to defend himself,” Feinland said. Adachi said the case was overcharged.